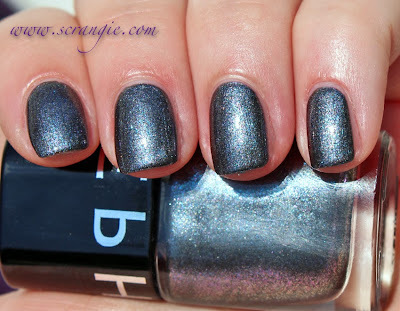 Shimmery charcoal grey with iridescent shimmer flecks. The main shimmer color in this is a blue/purple duochrome (starts to flash gold at extreme angles), but there's also silver and blue-grey with little glints of teal-green here and there. The formula on this was good. Not too thick, not too thin, nice even consistency, no application problems. This is a mini-sized polish but it still had a decent brush. Dry time was good. Dries a little dull but looks better once I add topcoat. This is the first color I've tried from Sephora's new Color Hit line and I'm disappointed in the color but not the formula. 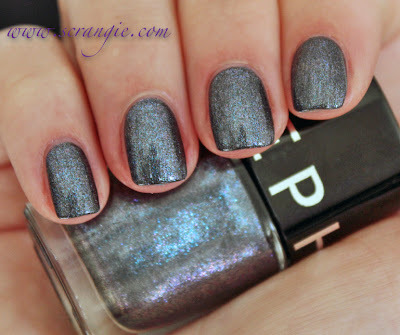 I expected this to be a black with rainbow glitter but it's actually a blue-grey with a little duochrome shimmer. No contrast to the color at all and it looks all faded and bleh to me. No life, no sparkle. Also brings out a ton of redness in my skin (the dreaded lobster hands, oh no). I'd like this a lot more if it had a true black base to give a little lift to the shimmer, cause the shimmer is pretty cool if you look closely at it. Oh well, it was only $5. I don't see lobster hands effect on you. I think I might pick this one up when I go to Sephora next time. It looks interesting and I don't have similar colour in my collection. I grabbed the coral creme (the name escapes me) and love it. Basic color, but I really enjoyed the formula and the brush. I see a lot of colors in there, but you're right they could be stronger. Haven't tried this new line yet, but glad to hear the formula was OK!